Two years ago, Jodi Stevens felt a lump in her breast. This year, she’s the honorary survivor at the 2017 Plant City Relay for Life. Growing up, Jodi Stevens assumed she would get cancer. She just didn’t know when. Stevens rallied around her family when her mother, grandmother and aunt were diagnosed. Her family history led her to begin getting mammograms at a younger age. Two years ago around her birthday, Stevens felt a spot on her breast. At the time it was nothing, but six months later she had the spot biopsied. Stevens wasn’t taking any chances. 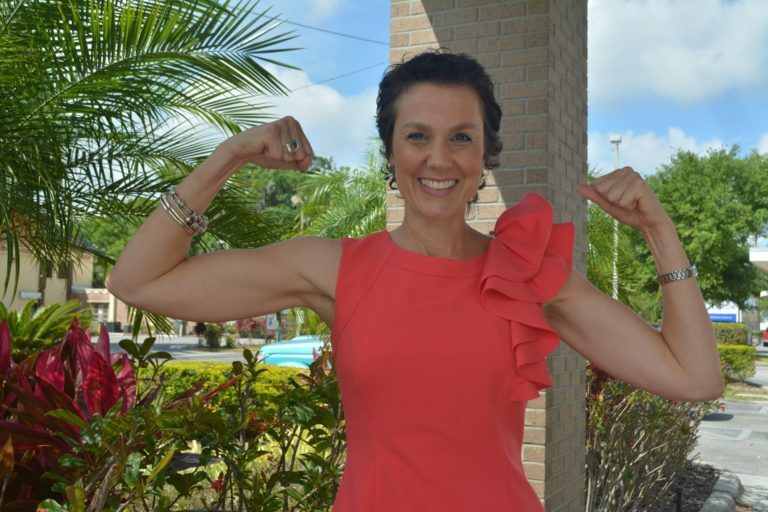 She underwent chemotherapy and radiation, planning her chemo treatments around her work schedule as the physician services manager at South Florida Baptist Hospital. Her treatments took place down the hall in the hospital’s oncology center. In two weeks, Stevens will join fellow fighters at the 2017 Plant City Relay for Life. This year, she’s the organization’s honorary survivor — she’s cancer-free. “And doing just fine,” she said. Jodi Stevens with her children, Evan and Jena. After a lumpectomy in late 2015, Stevens underwent a double mastectomy three weeks later. She started chemo the following month after cancer was detected in her lymph node, and finished her sixth round in June 2016. She followed that up with radiation from July through September. The only time she cried, she said, was when she saw the results of her PET scan. The cancer was contained in her breast and lymph nodes, but hadn’t spread throughout the rest of her body. She was fighting her fate — for her future and her family. Her son, Evan, is 5. Daughter Jena is almost 3. For Stevens, the difference between being proactive and reactive could have altered her fate. But she knows it didn’t only touch her — it touched everyone. She chaired Relay for Life in 2005. When she spoke at civic clubs, she would ask everyone in the room to stand up. A few bodies would sink into chairs. Eventually, the entire room would be sitting again. Two years after she chaired Relay for Life, Stevens’ mom was diagnosed with breast cancer in 2007. At the time, Stevens was 29 and became proactive about screenings and check-ups. Today, her mom is a survivor. She’s found support in her community, including the hospital. After undergoing chemo at South Florida’s oncology center on designated Thursdays, she would return to work that day. She’d be sick over the weekend from the treatment, but looked forward to Mondays when she would feel back to normal. While she received treatment, coworkers, friends and family offered support. The door of her office was covered in cards offering words of encouragement. “This is my extended family,” Stevens said. “It’s the best place to be. They took exceptional care of me, as they do with any other patient. I have a tremendous support system. The community and friends brought me dinners, flowers, cards and text messages. That’s what got me through it. And my family was a huge support,” Stevens said. It’s been 10 years since her mother was diagnosed, and nearly two years since Stevens detected that lump. She recently had reconstructive surgery and plans to be ‘put back together’ by her birthday on April 25.